Do you feel like you’re caught up in a war within your own self that you are never enough, yet too much when you are being your best self? I think we have all struggled with feeling that we’re not enough yet we are too much at the same time in many, many different areas of our life. Outside of this war within ourselves, there is also that same feeling from woman to woman. It’s like there’s a war amongst women of who’s better at this? Who’s good at that? I’m trying to be it all, do it all, and it’s exhausting, pointless and it’s not what we are called to. 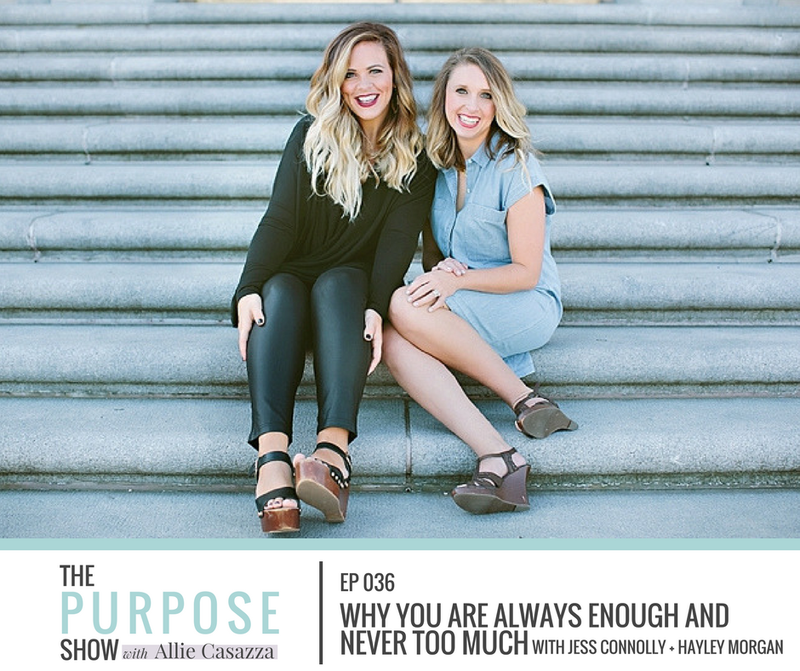 Jess Connolly + Hayley Morgan join me in a raw + honest conversation around how we are always enough and never too much. How we are called to live from a place of confidence in who we are, while encouraging others to do the same. Jess + Hayley are good friends who share a passion to lead other women in pursuing Christ and abundant life. They are mothers and business owners, and they co-authored the book Wild + Free, as well as their new book, Always Enough, Never Too Much. The concept behind Jess + Hayley’s book, Always Enough, Never Too Much. What it means to feel like you are never enough and/or always too much. How we as women as called to empower one another to live as our true selves. When you feel like you are not a good friend. When you feel like your to-do list is never ending. Personal moments when they felt like they were not enough or too much. What “wild freedom” is and how it applies to living in the mindset of being always enough and never too much. Stay tuned for the launch of Hayley’s new book this fall! Hey beauties! Welcome back to another episode of The Purpose Show! I have a very special episode for you girls today. I have Jess Connolly and Hayley Morgan here. They are good friends who share a passion to lead other women in pursuing Jesus, abundant life, and stepping into who they were made to be, which I really love. Jess & Hayley are both mothers and business owners. They co-authored the book Wild and Free. Their new book, which comes out April 24th is called Always Enough, Never Too Much. ALLIE: Welcome ladies! Thank you for being here! We are going to jump right in and get to it. Always Enough, Never Too Much. I am halfway through and reading every single devotional. It is a devotional, although I feel like it has the cadence of a normal book. It is broken down in devotional format which is really unique and I really like it. The main thing I am taking from this is, and the title says it, that you’re answering the questions “Why don’t I ever feel like I’m enough” or “Why do I also feel like I’m too much when I let loose and let my guard down and be myself?” Can you explain a little bit more about that idea behind the book and how you came to write this? HAYLEY: Yeah. I think that Jess and I, when we did Wild and Free, we realized that while we are similar in a lot of ways, we also approached the world really differently. We see the world differently and we experience it differently. When we looked at the feelings that we had when we interacted with each other, with other friends, with our families, it was this feeling of in the work that you’re doing and the way that you’re made that you can feel like you’re not enough or again, on the flipside, too much. When we started, few felt like one of us would feel like they’re not enough, that one of us would feel like they’re too much. But as we uncovered the whole truth that we found God has for us in His Word, we struggled to feel both, no matter who you are. The idea of not feeling like you’re enough. I don’t think I need to explain that. I think we all have a visceral understanding of that. The same with feeling like you’re too much. It is the idea that if you show who your true self is that it might be too wild, too crazy. It might be something that you need to tone down. Jess and I experienced that differently. It plays out differently in our lives, but it’s something that we felt was pretty universal, especially with women. I don’t know if this is the same thing for men, but I can definitely say that of all the women we’ve talked to throughout the country that they resonate with this feeling that we all have. Obviously, we couldn't have answered all those things in the book, but they were so cyclical and coming up in so many different ways, with so many different women, that we felt we had to write specifically to these scenarios. I think that's my favorite part about the book is that when you're feeling that specific way, there's a biblical answer for you. But you both come across it as here's maybe the reason that I'm like this and why it's amazing that God made me this way. And that it's OK to work on things and to grow and want to be better. You don't want to stay stagnant, but let's also stop for a second and praise that we are each fearfully and wonderfully made in the way that we are made as we are right now. That while it's good to have goals, be ambitious, want to change things, and always meeting new standards for yourself, let's not get down on ourselves with who we are right now. I really love that it’s a really, heavy theme throughout the whole book. JESS: I described it to somebody the other day when they were asking you about it and I said it's like sitting down with a friend who says “so what?” when you say I haven't been a good friend. A really good friend isn't going to be, “You're just always the best friend. You do everything right.” A really good friend would be like, so what? So what? So what if you weren’t a good friend? Number one, let's look at the truth of God. What does He actually say about you? What's actually expected of you? And so what? So what if you didn't do it well? What's next? And to take every different scenario and say, so what? So what if you're too loud? So what if you're too weak? So what if you don't have enough money? Let's talk about it. So what? ALLIE: Yeah, yeah, absolutely. I love that. ALLIE: I mean, it's so empowering too. And what I got from this was just the thought of I wish that every woman would have this mindset about herself and about her friends. I wish that we could all take this book and take its mentality, for lack of a better word, and give it to our own selves. Then each give it to our other friends. Understand that yes, maybe I'm not a good texter-backer, but here's my other strengths. Here's what I'm great at, here's what you're great at. I wish we could not have those expectations on each other because it causes so much divide, especially among women. And since I preached that so much in my own house and in my own family, it has a way of making its way into your heart. I think the idea of not being easily offended, but then also the idea of calling each other up. We talked about that a lot in Wild and Free, as Jess was saying. So what? Maybe you're not awesome at this, but this is the way I see you growing. This is the way I see God made you. This is what I see in scripture that says Jesus will do in your life. And these are the ways that we can grow up into a more sanctified, more refined version of who we are, not a shinier version of who we wish we could be. ALLIE: I just love that. What would you say, maybe breaking it down into a clear sentence. Why does this devotional differ from other ones that are also geared towards women? I was reading recently in Gretchen Rubin's, A Happiness Project, and she describes happiness as a kind of fog that you can see from a distance, but when you try to zoom in on it and really dissect it, it disappears. I really feel like this book was like that in the way where this is so different. It’s like the fog; when I try to zoom in on it, and ask, “Why is it so different,” it disappears. It's so beautiful. What would you say how it differs from other devotionals geared towards women and encouraging women? JESS: I think the biggest way that it's different is because it's so topical and it's very honest. I actually meant to pull up the different chapter headings, but we just said these themes - things like when you make mistakes, when you don't have enough energy, when you don't feel like a church girl, when you don't feel beautiful, when you need affirmation, when you need some privacy, when you're not that smart. I don't know any devotional that’s ever said here's what the Bible says when you don't feel smart enough. This is me being very honest right now. This is a very raw insecurity that I walk around with a ton, that I'm not smart enough. I have never found any Christian woman's book that says, here's what you do if you don't feel smart. I've never heard anyone say here's where the Gospel meets you. Here's where Jesus meets you if you don't feel smart. Even when you're sick, even when you've never led anyone to Christ. Then on the too much side, even when you're gifted. Even when you begged God for help. Even when you're a mess. Even when you feel like a tornado. Even when you cry easily. Even when you have no filter. Even when you're fired up about justice. These super real, raw, honest, topical things that actual women are actually struggling with and that we are scared to even bring to our closest friends. When we're even scared to say I need you to know I don’t feel smart. I mean it took me until about a year ago to finally out that with someone and to say, “I really struggle with thinking I'm unintelligent.” And I write books and teach for a living. That's problematic. You know? So that's what feels different about it to me is that it's not like a high lofty idea. We always talk about meeting people where they're at but this genuinely meets people exactly where they are at, exactly in what they're feeling. ALLIE: There's a lot of them that jumped out at me as, “oh my gosh, my good friend.” I had to screenshot it and send it to her. It's not even just for your own self. I think we can all relate to most of them, at least a little bit or maybe in a specific relationship, but if not, it's to encourage somebody else. And also to come to a deeper understanding of somebody in our life. As a person raising a daughter that's huge there, too. For friendships, for my own mother. I mean, there's so many things that just jump out as this is so real. And nobody is really saying it as it is what it is. I don't feel very smart. I don't really feel like a churchy-enough girl. Those awkward kind of things that we think in the inner deepest parts of ourselves that we’re maybe afraid to put into one sentence like that. HAYLEY: I totally agree. We came up with a lot of ideas based on things that we had heard from women after Wild and Free. We made a huge excel spreadsheet and started whittling it down. Are these too similar? Are these saying the same thing? Is this too niche? Or is this something that a lot of women feel? And then we split them up based on that. There are definitely some that I got where I was like, “OK, how do I write this from a place of maybe that's not how I was feeling that day? But a lot of times when I went to write it I realized, “Oh gosh, that is in there. Those fears, or that lack or that “too muchness” or whatever. I need to come up with a good word for that. Two more things that make it unique is that both of us wrote it. It isn’t very often that you get two perspectives. A lot of times it's either, “Oh, that book is for me, or that book isn't for me” and that can be great in a lot of ways, but it's really nice to have a ping pong kind of conversation. And thirdly, I am one of those people who I will get a bee in my bonnet and I will be, “I'm going to change the world.” And then at the end of the day I have 18 new journals for devotionals, three new study bibles and I'm signed up to take Greek and Hebrew somewhere. That's just the way my brain works. You know, that doesn't work really in real life and I'm learning that about myself so I do it less and less as I get older. But I'm the person who will start a devotional, get four days into it and then I'll be, “Yeah, this happened” or my mindset changed and I'm not really there anymore. Or I don't want to be X, Y, and Z, whatever that thing was that I was thinking about that day. What I love about this one is that although there are 100 devotionals, it doesn't have to be 100 straight days. It doesn't have to be 10 straight days. It's all titled very obviously and it can be the thing you pull out when you're like and, “Ooh, I feel like I am in a funk. I don't know what the deal is in my heart.” And you can scan it and I think something will jump out at you. It's very bite size in a lot of different ways. I appreciate that. This is not a sit down and study the word for 45 minutes kind of devotional. This is what Jess and I would say to you based on a lot of our 45 minutes of studying the Word times. It's what we would say if we were sitting across the table from you and we could look you in the face and say these things. This is what we would say. that it wasn't loosely based on scripture. ALLIE: When I'm skimming it and reading a section of it, I think, “What could they have to say about this one [verses]?” And then you say your thing and it's like, “I never would have gleaned that from that.” I liked that you said that the titles of each devotional are very obvious, because the titles are saying about yourself what you are too burdened by the emotions of feeling that way to describe about yourself that you're feeling that way. So many of them jumped out at me: feeling like you're not a good friend, what to do when your to do list is never ending. If you're overwhelmed you can grab this book. Sometimes to be honest, the Bible is overwhelming for me to open up. God always has a way of bringing me to the right place. Sometimes I'm struggling with an emotion and I don't know what exactly is going on because my emotions are very 100% and I get overwhelmed by that. For this to say “Your to do list is never ending; here’s a cup of water, and the scripture you know you need” because this jumped out to you. It's almost like you broke down the scripture into a little bit more of “Here, skim until you find one that jumps out at you. Here's some scripture that will refresh you today.” It's really clear and helpful. ALLIE: The book is flipped; Always Enough and then Never Too Much on the other side. And then even further inside, it is upside down when you get to the middle. It's like two different books. So how did you guys come up with that? Why did you guys decide to go ahead and do this? Because it's really neat. We love that it is different covers because I mean, it's different. It's loud and then gentle and says, “This is who women are.” We're not easily encompassed in a single thing. I've literally noticed since I've gotten my copy that some days (I keep it on my coffee table) I will turn it over on the blue side, and sometimes on the white side. Do I want it to be little quiet and peaceful in here or do I want it to be like a little splash of wild in here today? We were pretty creative gals, but that was not our idea. ALLIE: I love it. It makes it more approachable somehow. It’s fun. Super cute. HAYLEY: These are the kinds of books that booksellers hope you pick up for your friend, your mom, or your sister. Anything that we can do to make it more appealing, more attractive, more exciting to pick up, I think is even better. I am not a huge devotional reader to be honest. I love them, but it's not something that I normally pick up. I was really excited that they had something innovative and something that makes it feel like a gift. It feels like something really pretty that you want to have out. I think half the time that's the battle. It’s why I leave my Bible in my backpack that they carry everywhere or it's on my kitchen counter because I want it to be easily accessible and I want to have it out. That felt important, I think with the book, to make it something that people would want to have around. ALLIE: Yeah, for sure. I'm curious, is there a reason that you chose 100 devotionals instead of like a year-long or, or just a random number? Did it just work out that way? HAYLEY: Well, I think for me personally, it was important not to have a lot of duplicated content from Wild and Free. While sure, we'll have a lot of readers that never read Wild and Free, but once they did, they're like our soul sisters. They're like our friends that we've been with forever and we wanted this to be a gift for them too. It's a huge undertaking to write a year. I mean as somebody who writes and who does podcasts and things, it's a huge undertaking to do 365 entries. I think it was an approachable place for us to start as writers. For me personally, being a somewhat public person, I feel like we're leading the younger generation in how to do this creative life, it was important to me to not over leverage myself really, and to have it be approachable from a creation standpoint, because it’s a good example to set, how it can still be really impactful. I think realistically for somebody to sit with my voice for 365 days or a 180; I think that’s a lot. I think 50 will do. JESS: I read the audio book and my favorite was reading Haley's devotionals because we're such different writers. Nothing makes me happier than when someone comes up to me and says, “I read Wild and Free; I didn't really like your writing.” But Haley is such a phenomenal writer. I am a communicator. I am a talker. I would have to Google a lot of words. I think I texted her one day and said, “Do you remember what the word “indefatigable” means? It’s such a good word; it means you can’t be too fatigued. which is a great, beautiful way to say that. Hayley was actually the one who told me while we were writing Wild and Free. She said, “most people only read 40% of a book.” That changed the way we wrote Wild and Free. As an author, you really want to take people on a journey that they want to complete. You don’t want to lose them 40% of the way in. I would just say, as the three of us right here, we’re quick, smart, hip, millennial women and we got to move on sometimes. But that's the other reason why I don't want it to be a year-long devotional because I don't women to be thinking about this for a whole year. I want them to feel so empowered, equipped and changed in a hundred days and feel, “I'm ready. I'm giving it to a friend.” What's next? You know? Of course, there's going to be things that we struggled with, that we come back to, that we revisit. HAYLEY: Writing this devotional was just as much preaching to myself as it was telling everybody else. I have really realized that it takes not just learning, not just knowing, but it takes obeying. I don't want you to be just reading for the whole time. I want you out there practicing it in your day-to-day life, moving it from knowing to understanding. Something that's actually in your spiritual DNA. ALLIE: My gosh, I love that. You were saying this is more in-depth examples of the feeling that you got from Wild and Free, so can you describe for somebody who hasn't read the other book, what is that idea of “wild freedom” in your own words? JESS: I would say it is believing the kind of audacious truth that the Bible puts forth - we are made good in God's image and made free by the power of Christ. Those are things we say – “God made us” and “We’re free,” right? Yes, we're free, but why? The message of Wild and Free is saying, “OK, let's take it past “nodding” at that and let’s step into some agreement about what it would look like to agree with our whole lives. That we are made good. That when He created us that He did not make mistakes. That He didn't make us in fear of what we would turn into. The freedom that Jesus purchased for us on the cross is real, active, alive and working in our lives. HAYLEY: I think “wild” is walking in how God made you and “free” is resting in what Jesus has done for you. I think I had to learn the “rest piece” really early on because it was the lesson that God had for me to learn when I was probably 18 and 19. I find it very easy to find my words in what I do, what I could do for people, and what I can accomplish. My husband (he wasn’t my husband at the time) saw that in me and he saw that it was a wall that I put up, that I wouldn't let him know me. And for some reason I had to learn that early on. But this “wild” situation has been a journey and it is hard for me to learn. Every “layer of the onion” that I pull back I see more of myself. I know more of myself because I know more of the Lord. I know how He is and I can see more of how I am. Also, God is wild. And that means I am wild. That's a little stressful for somebody who likes to be appropriate and likes to have the right answer for things. Something that Jess has said that has been so helpful for me, and she says a lot, is “taking it too far.” What would it look like if you took it too far? Because I'm a person who would take it as far as is appropriate and then I’ll stop. There’s so much freedom for me in that insight. It’s saying, “So what? So what if you take it a step over the line there?” If we're doing things in freedom in the way that God has made us, and the way that He has redeemed our lives, if we take it too far, that's a good thing. Just rub that in. ALLIE: I love that. If you guys wouldn't mind, could you share a recent personal example in your life or maybe just a piece from the book? Whatever you want of a time where you recently felt like you were either “not enough” or “too much” to give a taste of what is in the book and how you approach this for listeners? I just opened up a dialogue with my husband. My husband’s a pastor at a church we started. This is a common, never-ending struggle for me. We are the leaders. We always say, “Beth Moore apparently is not going to show up. I keep waiting for her to come and lead us and she's not. So it's just us.” That’s a normal, every Sunday occurrence. And I said, “I know you. I know we've said this so many times. I want you to know how uncomfortable it makes my soul to just say “no” from the get to. Going back to “OK to be a normal human, to be a healthy human, to do what God is asking you to do, I'm going to have to say “no” to people I really love, really care about and want to support.” I know they may be disappointed, frustrated and may not understand. I can't control it. This is in the devotional. I constantly go back to the idea that Jesus disappointed people and that he was still Holy. We read stories in the Bible about Him pulling away from shore and there's hundreds of people waiting for Him to heal them and he's like, “Bye. I need a nap. I am a human. I need a nap.” That is so comforting for me. That was a big “not enough for me” that happened in the last 48 hours. One of the girls is still mad at me and hasn’t texted me back. This is a daily obedience sort of thing. And I think that it speaks so much to identity and so much to obedience that they're not things that we're going to just learn and move on from. I think that we will move on from them more quickly, we’ll obey more quickly and we'll be more rooted in our identity, but they will continue. I think I'm the person who wants to eventually not need the gospel. I would like to be able to one day study enough to score 100 percent so I can go onto Gospel 201, thank you very much. I mean that says so much about my personality. I don't like to be weak. I don't like to not know things. I don't like to appear as though I don't have it together. And in this season of my life, it has been the Lord inviting me to not have it together. It's actually a way that I felt like I was “too much.” I'm going to the Festival of Faith in Writing in Grand Rapids on a last minute decision trip and all of the hotels are booked up. But it's close enough for me to drive, so I'm going to go. We can make it work with our family. It's good to do. I need some refreshment creatively. This is good. My husband can make it work, which is doubly “OK great, we'll do that.” But there's nowhere to stay. I could stay further out of the city. We could pay more money to do it, but it's not wise for us right now. Just like you were saying how deeply uncomfortable that made you, I felt the same pushback, that same resistance. “No this is just not who I am. I do not do this.” I would rather hide, go make an expensive hotel reservation 45 minutes away and drive in an hour and a half round trip everyday than ask a friend to put herself out. I mean this is the kind of thing that I deal with. It is an actual obedience issue for me when I'm presented with that to do it anyway. I about want to cry just talking about it because it feels so visceral and so real. I know you were saying the same thing in texts, Jess. This is never ending. It continues to come up. But it's a comfort to know that when it continues to come up, that’s where there is solidarity. We’re all doing this together and Christ is in this. He goes before us. He comes behind us. We're surrounded with heavenly hosts, all the things. We don't have to do it in our own power. That's even the better part. JESS: I love you said that too. It’s not too much. It's not too much that you would want to stay in somebody’s room. I mean, whoever it is will probably be thrilled to have you. It's not inadequate of me that I don't have time to hang out. I think it's when we show up and keep being obedient that we even changed the language, so that one day 10 years from now, they’ll start calling that too much. To me there's been those things in my life where I didn't understand it, and then all of a sudden I did and it was like a light bulb. Then there's these things that you go on a journey with the Lord on, and for me it has been identity and obedience. It’s been those two things. That's why I feel like Wild and Free is really foundational. It’s not new. It's not whatever. This is age-old stuff. I wish I could tell you that I sit here and have it all figured out, but I'm still working through it. Honestly, it’s been an honor to continue to walk through it with other women because if I felt I had just finished that and worked it out, why keep talking about it? Why keep going out there and telling other people about it? ALLIE: Another thing branching off of what you just shared is that this book is something you can reference again and again. It's not a one and done. It’s not “a 10-step formula to never be too much” It’s chronic. I was in a conversation recently where this woman was telling me how disorganized another woman that we both knew was. She was going on and on, “It's just so frustrating. I get it. She has more kids than me, but it's just so frustrating.” And in myself, I was panicking. I have four kids like this woman and I had this feeling of sadness over how we judge each other, bring each other down, and that this has probably been spoken about me who knows how many times. And it was almost this surreal moment of panic that this is a war zone. Why does it have to be that way? It absolutely does not. And that is not what we're called to. I ended up sort of exiting the conversation with, “Well I'm not going to lie. I've definitely been way more disorganized.” But it really hit me. This book was so well timed that week for me because that is what it is. It is a war zone out there and these women are comparing and slinging things at each other. We all guilty of it at some point. Everything would change. It would all be lifted. Haley, I relate to you so much in that need to be on top of it all. Your story about the hotel, I was crawling inside, “Don't do it! Don't ask to stay with them!” It’s so silly! You've got four boys, right? Yeah, I have four kids. There are so many things that absolutely must slip through the cracks. Why is that not OK? It doesn't make sense. It's all in our flesh and it's all a lie that we don't have to live by it anymore. I love your message. I love what you are doing. It's so beautiful and so needed. It's amazing. Always Enough, Never Too Much came out April 24th. I will link to all of that for you guys listening. For those who maybe want to just connect with you guys and watch you a little bit more personally like Jess, I know you're like me and an Instagram girl, I'll link to all that. Is there anywhere else you want to lead people where ladies go to follow you and connect with you? JESS: I am on jessconnolly.com and yes, always on Instagram. Just can't get enough of it and that's about the only places you'll find me these days. HAYLEY: I'm hayleymorgan.com and I am on Instagram some. For me, I am starting to wonder what’s next? Where are we going with this? I am always thinking where our attention is going to next? Where are the younger women going to be placing their attention? So, I'm going to be experimenting a lot in this coming year and seeing what fits with the rhythms in my life and the rhythms of what other people are listening to online. I'm sure that there will be 10 different things that I try and maybe one that works in the coming months. ALLIE: Perfect. We'll link to all of that so you guys can connect with Jess & Haley. I’m so excited for this book to get into the hands of so many women. I'm proud of you guys for first of all, busting stuff out like psychos. Jess, you've done Dance, Stand, Run. Wild and Free was recent. JESS: Hayley just finished her book. It comes out in the fall. ALLIE: Yeah, you guys are awesome. I'm so inspired by you and this is great. Thank you so much for your time. I will link to everything in the show notes and I'll talk to you next time!